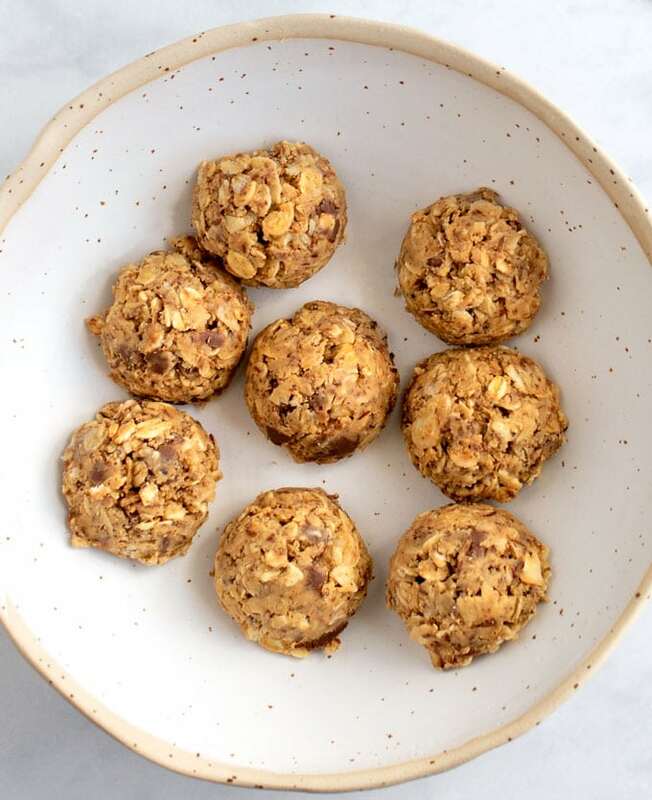 These Oatmeal Peanut Butter Energy Bites are heart-healthy, protein-packed, high in fiber and they taste GREAT. 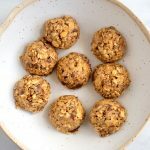 They are the perfect afternoon healthy snack or grab-and-go breakfast that will give you a big energy boost, keep you feeling full AND delight you with crunchy, nutty, sweet and salty satisfaction. Plus they’re easy to make. 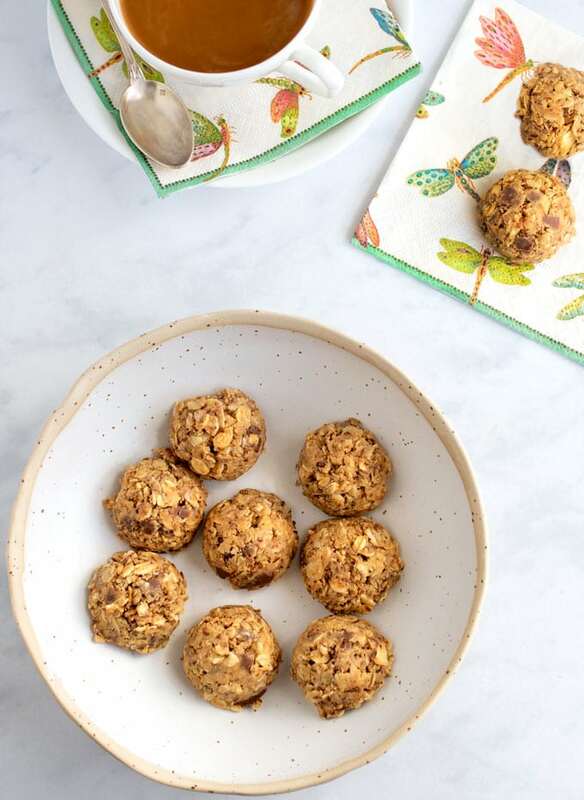 Before we get into more about these peanut butter energy bites, I want to tell you about a course I’ve enrolled in that inspired this recipe. I’m in the midst of taking a professional nutrition course at Leith’s School of Food and Wine in London. Part of my homework is to develop healthy recipes. I’ve decided that if they turn out great, like these Peanut Butter Energy Bites, I’ll share them on the blog. If you follow Panning The Globe, you know that sharing healthy recipes is not something new around here. “Healthy and delicious” is my mantra. I use only wholesome ingredients in my cooking and I minimize unhealthy fats and sugars. For example, check out this recipe for non-dairy olive oil roasted garlic mashed potatoes or this popular no-mayo avocado chicken salad recipe. Why use saturated fats in a recipe when a dish can taste fantastic without it? I’m excited to learn lots more about the science of healthy eating so I can bring even more delicious and nutritious recipes to the table. Starting with these tasty high energy snacks. Rolled Oats: Oats are high in soluble fiber, with many beneficial health effects such as lowering blood sugar and cholesterol levels. Almonds: Almonds are heart-healthy and packed with nutrition, high in protein, monounsaturated (healthy) fats, vitamins and minerals. Flax seed: Flax is an excellent source of omega-3 essential fatty acid and a very good source of dietary fiber, magnesium, potassium and manganese. Peanut Butter: Peanuts are high in protein and monounsaturated (healthy) fats and they have a good amount of vitamins and minerals. Dark Chocolate: Studies have found a number of health benefits from eating dark chocolate such as a reduced risk of heart disease. We already know the psychological benefits – it makes us deliciously happy. 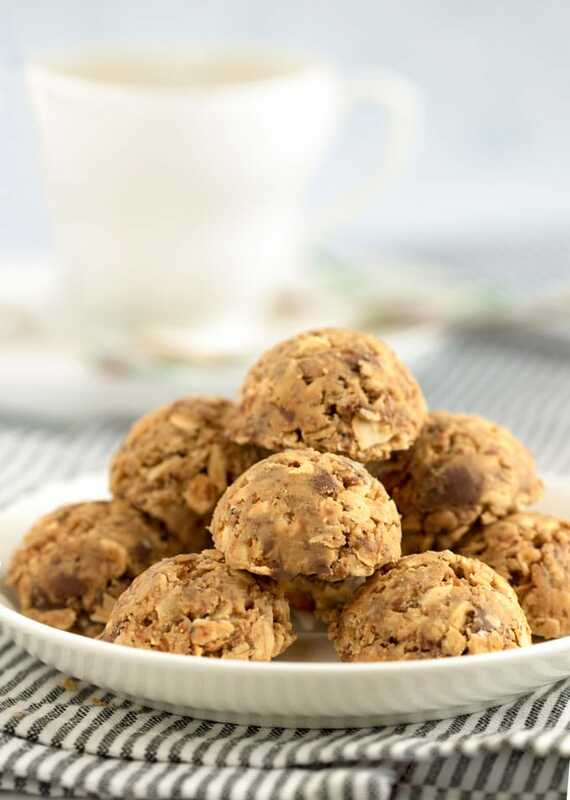 Many energy bites and energy balls recipes use raw oats and nuts. In my opinion, it’s worth the extra effort to toast the oats and almonds. It takes a few minutes in a dry skillet and the flavors are greatly enhanced. Also, toasted oats are more digestible than raw. Combine toasted oats, almonds, flax seed, chocolate, salt, maple syrup and vanilla in a bowl. Add peanut butter and mix well. You might want to start with a spoon and then use your hands to get it all blended really well. Don’t worry if the mixture feels sticky. Let it sit for a few minutes. The oats and flax will absorb some of the liquids and your mixture will be ready to shape. Line a baking sheet or tray with parchment or waxed paper. You can roll the mixture into balls if you like, but I prefer using a measuring spoon to create neat little dome-shaped cookies that sit flat. Scoop up a generous tablespoon full of the mixture and press it firmly against the side or bottom of the bowl to pack it in. To release the energy bite from the spoon, push in gently on one edge of the filling and it should slide right out. Place it on the prepared sheet. Repeat until you’ve used up all the mix. The recipe makes about 24 tablespoon-sized peanut butter energy bites. These are fun to share! I’ve been making a big batch every week. They’ve become my go-to late afternoon pick-me-up, with a cup of decaf or tea. They last for a week in a plastic bag or airtight contain in the fridge. They’re perfect for grabbing when you want a healthy breakfast on the run. You can throw a couple of them in your kids’ lunch box or into your own for a delicious healthy dessert. You can grab one or two when you’re needing an afternoon pick-me-up and you’ll be good to go until dinner. 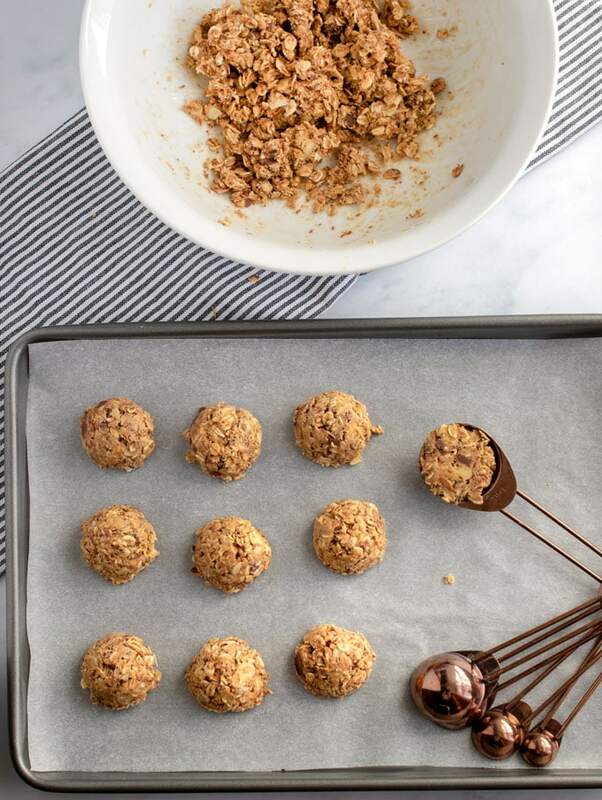 Here’s the recipe for No Bake Oatmeal Peanut Butter Energy Bites. If you try this recipe I hope you’ll come back to leave a rating and comment. I’d love to know what you think. A nutty, crunchy, healthy, protein-packed, high-fiber snack that tastes great and is easy to make. The perfect afternoon pick-me-up or grab and go breakfast. Line a tray with parchment or wax paper and set aside. 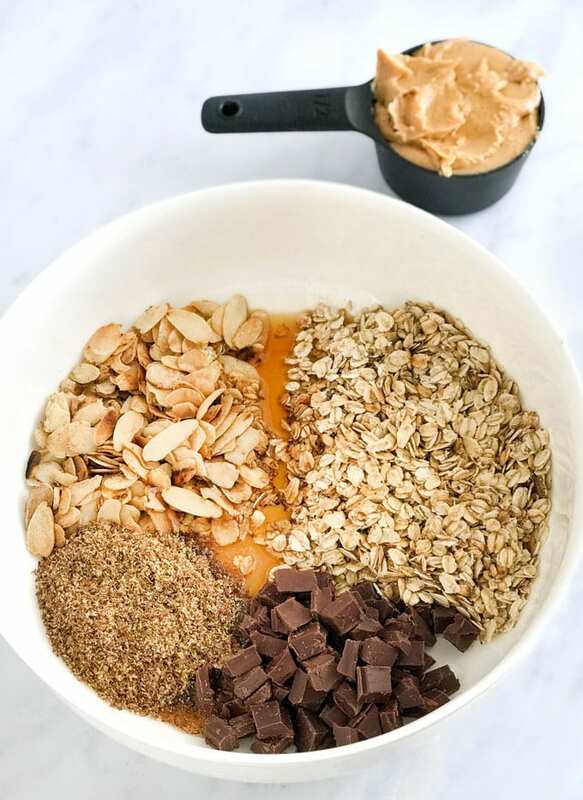 Combine toasted oats, toasted almonds, ground flax, chocolate and salt in a medium bowl. Add maple syrup and vanilla. Stir to combine. Add peanut butter and mix, using a spoon to start and then using your hands to work the ingredients together well. Don’t worry if the mixture feels sticky. Let it sit for a few minutes to allow the wet ingredients to soak into the dry ingredients. 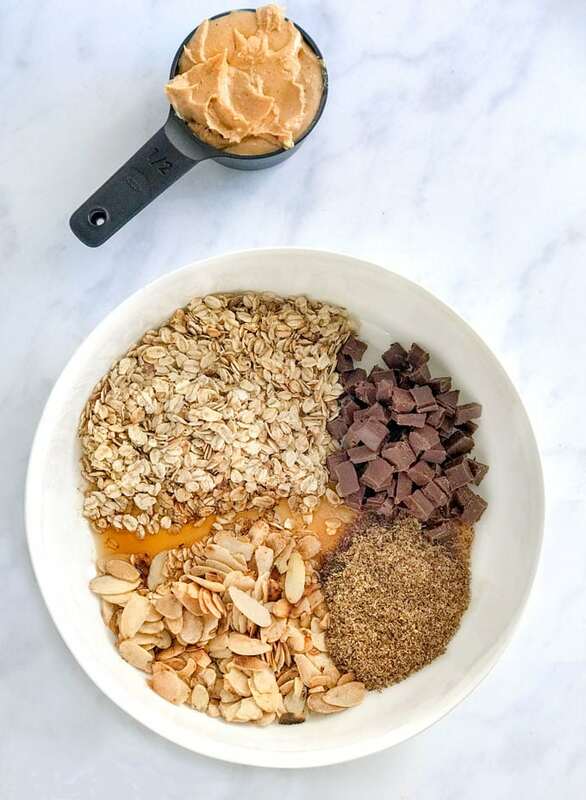 Peanut butters differ widely in texture so If you find that even after a few minutes, the mixture sticks to the spoon when you try to shape the bites, add a bit more oats. Shape the bites: You can roll up a tablespoon full of the mix into a ball or, my favorite method is to use the tablespoon of my measuring spoons to shape the bites into little domes. Scoop a generous tablespoon full of mixture and press it firmly against the side or bottom of the bowl get it packed in tight. Then, gently push your finger in on one edge of the oat-peanut mixture to nudge it out of the spoon. It should slide out easily. Set the bites onto the prepared tray. Eat and enjoy! Peanut butter energy bites can be stored in a plastic bag or airtight container in the fridge for up to a week. *Toast oats in a dry pan over medium high heat, stirring constantly, for a few minutes, until they color slightly. *Toast almonds in a dry pan over medium high heat, stirring constantly, until they turn golden brown in spots, about 2 minutes. Delicious! I love the flavor of the toasted oats and almonds-quite satisfying. I made a batch less than 12 hours ago and noticed that my family has reduced the count by 10…I think this is going in the regular weekly rotation❤️ The mix was a bit dry for me, but it could be because I live above 5,500 feet and need to add more Liquid. Hi Hilary, the dryness could be the altitude or maybe the type of peanut butter you used? You can try adding a bit of coconut oil or peanut oil in the next batch, if you like. Anyhow, I’m really happy to know you all enjoyed. Thanks for your note! These cookies are so tasty. Hard to believe they are healthy too!! Can’t wait to try and hope I can eat just one. Yum!!! And vegan! Thanks Lisa! Can’t wait to try!! I hope you enjoy Jen! !